Are you using Windows 8 Operating System on your PC? There is an extra security feature that can be enabled once you are using windows 8. The security is all about you, using your picture as password for securing your personal computers. If you are using Android device, this is also equivalent to the security pattern which is used by most of android users. Very easy to set up, all you can do to get this set up, is just to select any preferred picture or image and then draw hard or simple pattern, which you can remember easily without many trials and errors. 2. Next, click on Change PC Settings which is at the bottom of the column. 4. 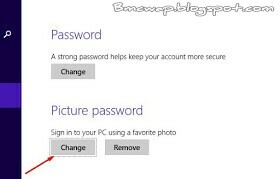 Click on where you see change button which can be found exactly below "Picture Password"
5. This is the point where you will select any desired picture/image of yours, then do well to follow the on-screen instruction in other to draw the exact parttern you desire for the password. 6. Finally, restart your laptop/PC in other to see the applied changes.